If ever there was a need to focus our attention, to ‘be’, to be intentional in our locality and the world, to draw in or harvest positive energy and direct it to those who need it, it is now. What we do is preceded by our thoughts, what happens externally through us was initiated in that interior realm, and any power we use comes to us from far beyond, and flows through us. It does so because That Which Is Bigger Than Us graces us with the status of ‘co-creators’. There is a great need for the power of the Caim – that circling ritual or prayer. A few weeks ago we looked at the Caim in outline. See here. There are various uses for the Caim. Traditionally, a ritual of individual protection, it can be adapted to suit the requirements of the hour. The main part of the Caim, I call ‘Standing in the Gap: Using the Caim’. After preparing the Caim, that is ‘drawing’ or casting the Circle, it is here, in this middle segment, that the actual energetic part of the ritual takes place. And as regards that, here are a few journal ‘fragments’ of previous Caim ritual to encourage you to consider using it. Ofcourse, you can take parts of what follows and ‘mix and match’, and so you don’t only have to use an activity highlighted by me in, say, the healing section, there only. But, you can adapt it and use it elsewhere, as appropriate. As I stood, alone, in the middle of the circle, with only candle-light flickering in the corners of the room, I closed my eyes. I had brought a photo of someone that had a dangerous kidney complaint and who was in need of urgent healing, and now held that photograph close to my heart. I started to imagine them. I faced, roughly, the direction of where that person lived, and said out loud what was on my heart, and sought the One to heal them. At times like this, I think it is important not to be (too) prescriptive as to the outcome and how it is to be achieved, but to leave that to the One. However, I do believe it is right to visualise that person as they would be when back to full health. And so, I raised one hand, upwards, metaphorically heavenward, and closed my fingers rapidly as if grasping something quickly. In my mind’s eye I visualised grasping ‘solidified healing’ from above (okay, that may stretch the imagination too much, but to me at that time I visualised sparkling, golden, radiant, healing, heavenly fog! For those that have come across the word, think: shekinah). This visualisation is a metaphor, but it’s powerful and effective as it is intentionality that is all-important, and so I ‘threw’ (or, more accurately it was an open-palmed ‘push’, of) what I had gasped toward the person in need and healing, and uttered the words, Be healed’. More of the poem can be read here. It is my belief that, in this case, all people, everywhere with the same complaint would benefit in some way. That Which Is Bigger That Us is so, so generous. Alone, and in that circle, I was moved to pray for a part of the world where tribal divisions had erupted, innocent people were being harmed. There was a great need for negativity to be transformed into positivity, hate changed into love, anger into peace. At other times I’ve prayed for ecological disasters to be abated and/or transformed. This time I had brought a globe (of the world, but a print-out or rough drawing of the countries’ outline would suffice) into the circle, and placed my hand, open-palmed over the area in need. As I imagined that area which was in need, I breathed in. As I breathed in, I imagined breathing in all the negativity, pain and hatred of that region. As I breathed out, I imagined the love and peace of the Universe flowing through me (and others) to people in that region. I did this several times: breathing in negativity, breathing out love and positivity. Some may recognise this as a form of tonglen, a deep and effective technique used by Buddhists and others. Breath has been used as a powerful metaphor for healing and blessing from ancient times: Think: John 20:22, The Book. At then at the end, as a variation on tonglen, and if you’re concerned about inhaling at that negativity, although the The Source of All can effectively deal with it without any detriment to you, you could try the following: With the idea of one deep exhalation and inhalation in mind, arch you head back so your face is heavenward. And then as you imagine negativity, exhale! Imagine it all leaving your body. And then, as you visualise light from above flooding you, inhale deeply. There, it’s done. If ever there was a need for cleansing from formerly inhaling negativity, the situation is reversed and you’re cleansed. Whereas the abovementioned was very much centred on an individual conducting a Caim on behalf of another or a local or global area, sometimes the Caim can be included within a larger ritual or even be a larger, formal ritual itself, and might be used in various ways. For ceremonies or services to do with ecology the Caim could be used for land healing, global healing, for seeking to redress a specific disaster or wrong and sending energy out. It might be used as a blessing circle. The service or ceremony leader might invite, one by one, all those who would like a blessing, a change of ‘luck’, inner cleansing, or a new start, or healing. Or, for the start of a new company or project. It could be used as part of an animal blessing day (perhaps on the feast day of St Francis) and pet-owners, along with their pets, could be invited into the circle. How formal or informal you make this part of the ceremony is up to you, but in all cases it is best if a few minister to a group of say a couple of dozen or more. I’ve led a number of formal, liturgical Caims, and they are very moving, indeed. You might include drama, enacted/active metaphors, poetry, or words that the congregation can join in, periodically. In such cases as a handfasting, appropriate attire was expected. If it helps others to think or meditate deeply, to be drawn, positively, into what is going on (liminal encounters) then appropriate attire is an asset. Ofcourse, what you wear as leader depends on what is expected of you and how comfortable you feel. 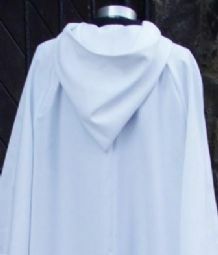 And so, on this occasion, a handfasting ceremony, I wore a hooded robe (but please don’t think ‘cosplay) in white, or if outside in woodlands then I would have worn a brown one (think Franciscan). Around the waist I tied a white cincture (think: belt or, better still, think white rope). I hung a chain around my neck, with a symbol on it. 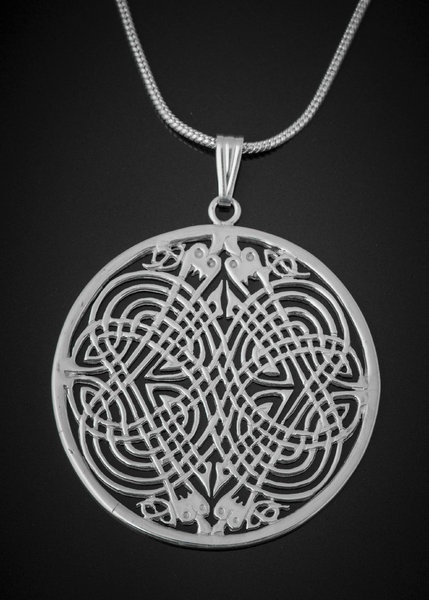 On this occasion the chain held a circular pendant depicting four Welsh/Celtic dragons representing the four elements, or the four persons of the Trinity (and if you find that confusing or heretical, do ask me.) On other occasions I’ve hung a Celtic cross, or similar, on the chain. And then, I wore a stole – a white one with the symbolic fishes (representing the Christ) – think: long scarf, similar to what one of the Dr Who characters wore. I’ve got several stoles: white, black, red, green etc, some simple and others with symbols stitched on them, and wear them depending on the ceremony type, or season. What you wear, and usually the less formal the better (unless it’s a formal handfasting or large ceremony to usher in the seasons etc) doesn’t have to be flamboyant. Something simple can be worn as a token symbol – it doesn’t have to be expensive, and it can be just as meaningful. Why bother with all this? Well, you don’t have too. But wearing different clothing may help you, it may assist others to recognise that something altogether different is happening and that all have entered sacred-space, and have been ushered into the liminal realm. It is there, where significant and mysterious things and power can positively be encountered by all. Think of the way surgeons might sterilise their hands and wear operation-green clothes as they prepare to undertake an operation. It shows that some different is about to happen, and that ‘they mean business’. It is the same here, though its not essential, it might be worthwhile and beneficial to you and others, to set aside certain clothes and/or pendants etc for ceremonial or ritual use. Think of religious leaders and clergy, ancient and current-day Celts, Druids, Pagans and others. Apparel can be important to them, and to you. The Caim is adaptable, and how you use it will be determined by you and the requirements you and others have. Do experiment and do enjoy the experience. And, if you would like to refresh your memory of the essential Caim, details can be found here. Have a happy and blessed time using the Caim. This entry was posted in Circle/Caim and tagged Caim, christianity, druid, druidism, Druidry, ritual by Tadhg. Bookmark the permalink. Thank you these articles were most helpful. Are they published or available for general use? Hi Helen. Many thanks for your positive comment. Articles here can be used anywhere so long as it’s not-for-profit and attributed, so ‘republishing’ on blogs, websites, Facebook pages is good. A number of readers have mentioned the suggestion that I should do a printed version, and if all goes well there should be something in print of some material used here, and some new material, ready for Christmas. Many blessings to you and yours, Tadhg.